Spring Hill, Fla. (March 13, 2018) – Housing Trust Group (HTG), one of the nation’s largest developers of affordable housing, celebrated the grand opening of Hammock Ridge, a $36 million affordable housing community in Florida’s central Gulf Coast. The four-story Hammock Ridge provides 104 affordable apartments to individuals and families earning 60 percent or below the area median income (AMI). Rents range from $287 to $704 per month, including utility allowance, and it is 100 percent leased upon opening. Public officials, community members and guests gathered this afternoon at the property, located at 8234 Omaha Circle, Spring Hill, Florida, for an official ribbon-cutting ceremony and reception. During the ceremony, Matthew Rieger, President and CEO of HTG, thanked the city of Spring Hill and Hernando County for supporting the development. HTG broke ground on phase one of the project in February 28, 2017. Hammock Ridge includes 12 one-bedroom, one-bath units; 60 two-bedroom, two-bath units; and 32 three-bedroom, three-bath units ranging in size from 673 square feet to 1,162 square feet. Hammock Ridge will add 92 more affordable units in 2019, dedicated to residents 55 and over earning at or below 60 percent of AMI. In addition to the tax and community benefits, HTG has made significant investment in the water and sewer infrastructure that serves numerous other public and municipal users. HTG will also pay Hernando County over $1 million in fees for the impact, utility connection, and permit. 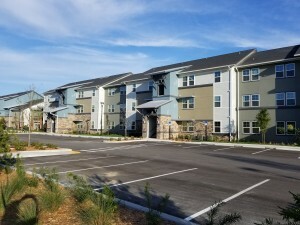 The project team for Hammock Ridge includes architect Fugleberg Koch; civil engineer Lucas Carlo; and general contractor Hennessy Construction, Inc.
HTG celebrated the grand opening of another affordable community today, Park at Wellington I and II, a community with 220 affordable housing units in Holiday, Florida. Additionally, HTG has four affordable housing communities under construction in Florida including Arbor View in Margate, Covenant Villas in Belle Glade, Douglas Gardens in Pembroke Pines, and Princeton Park in Miami. Housing Trust Group (HTG) is an award-winning full-service developer of multifamily residential communities whose real estate transactions exceed $2 billion in commercial, land and residential developments across Florida, the Southeastern U.S. and Arizona. HTG develops, builds and manages a diverse portfolio of affordable housing, workforce housing, market-rate housing, and mixed-use developments. For more information, please visit www.htgf.com.